The secret to running farther may not be some highfalutin training program, but the simple act of joining a running group. We’ve just finished crunching additional data from our survey of Racery participants earlier this year. We found that racers who reported never or rarely running with other people ran a median distance of 3.6 miles per run, while people who often/always run with others ran a median distance of 4.6 miles per run. The survey respondents were roughly split, with 72 saying they usually or always run with other people, versus 67 saying they’re solo runners. The obvious explanation for this mileage gap is that it’s easier or more fun to run when you’ve got company. In short, joining a running group causes people to run farther. Or does it? As we all learned in high school science, correlation is not causation. So we’ve dug further into the survey data, looking for evidence of other possible explanations for this correlation. Perhaps runners who run in groups have to first agree on times that fit each others’ schedules. With fewer opportunities to run together, maybe these runners tend to run farther on this subset of available days? But this is not what we see in the data. Respondents who run in groups actually run 6% more frequently than those who run alone – 3.32 runs per week versus 3.13 runs per week. So let’s consider a third hypothesis. Could it be that novice runners are more likely to alone because they don’t want to hold back runners who are more experienced, faster or longer-distance? Unfortunately, we didn’t survey how long Racery participants have run or their normal pace or distance. But we did ask questions about runners’ participation in normal races, and you might argue that race participation is a good proxy for a strong investment in running. 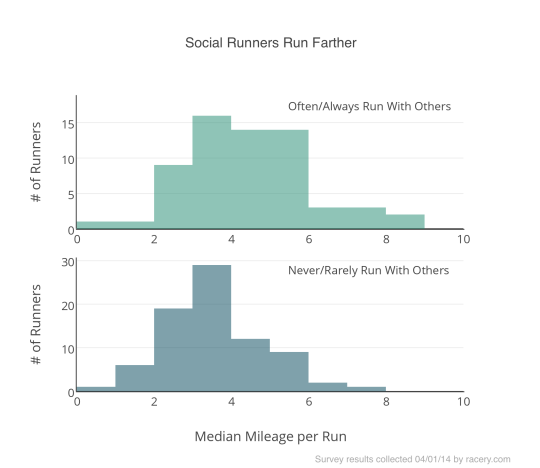 And the distances that social runners report having covered in their races also indicates a link between being a group runner and having a strong commitment to running. Fully 39% of nonsocial runners have run less than a total of 20 miles in races in the last year, versus just 14% of social runners. 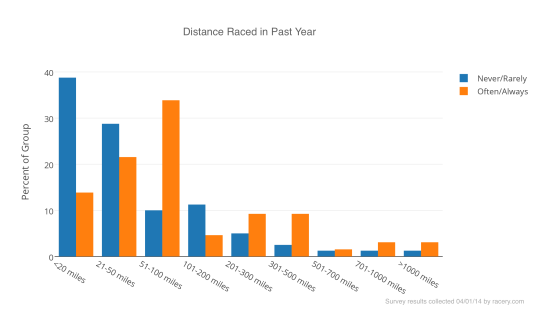 And 26% of social runners ran more than 300 miles in races the last year, versus just 11% of solo runners. Bottom line: we’re pretty sure that if you want to up your mileage, run more frequently or race more, you should join a running group. At worst, you’ll have more fun!